In this step, you will download Red Hat Enterprise Linux Server. For the download, you will need to register with developers.redhat.com. After you register as a developer, you will be given a subscription for Red Hat Enterprise Linux Developer Suite. 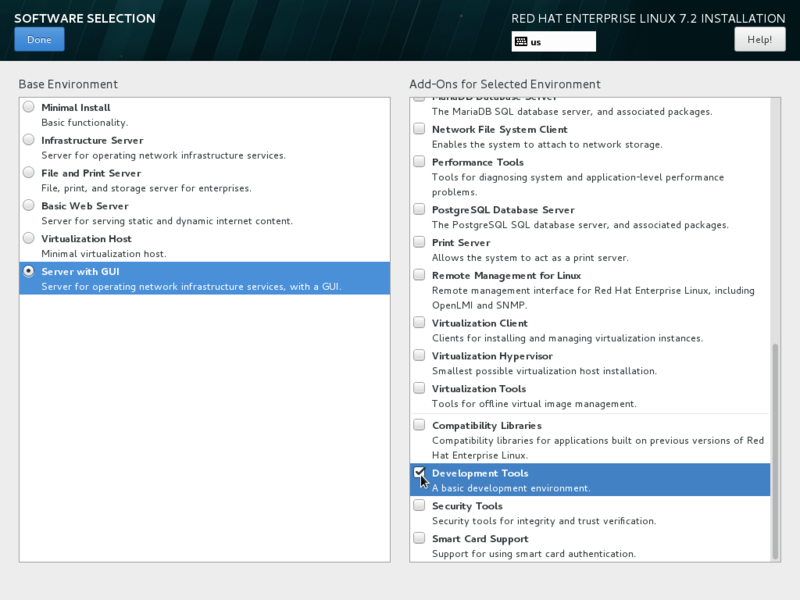 Red Hat Enterprise Linux Server and additional development tools are included in Red Hat Enterprise Linux Developer Suite. Download the Red Hat Enterprise Linux Server DVD .iso file. Note: Later in this guide, you will need the Red Hat username and password you create during registration for accessing Red Hat sites. This section provides an overview of the key steps for installing Red Hat Enterprise Linux so you can get started with software development. Note: This tutorial does not replace the Red Hat Enterprise Linux Installation Guide. Instead, this tutorial provides an overview of the key steps for software developers. For detailed instructions, see the respective manual. The Red Hat Enterprise Linux Server .iso you downloaded in step 1 will be used to install a system with a full graphical desktop. You will select Server with a GUI under Software Selection during installation. 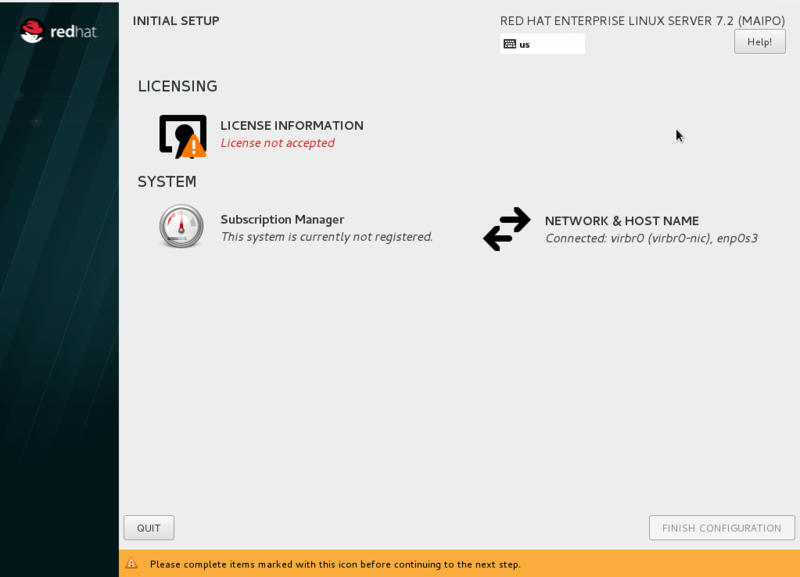 By default, Red Hat Enterprise Linux Server will not install a graphical desktop. You will need to select an Installation destination, which is the disk or partition(s) where the software will be installed. The disk or partition(s) you select will be overwritten. Make sure you understand your selection before starting the installation to avoid accidental data loss. You should configure networking under Network and host name before starting the installation. You will need access to the Internet to complete registration and download additional software. The network can be configured after the system is installed. However, the steps are more straightforward during installation. Create your primary user account during installation: After the installation begins, you will be instructed to set a password for the root account and be given the opportunity to create a regular user account. You should create a user before the installation process completes. The regular user will be your primary login for development. The root account should only be used for system administration tasks. If you don’t create a user before the installation completes, you will need to reboot and then log in as root to create user accounts. 20 GB of available disk space. For more detailed minimum hardware requirements and compatibility information, see the Red Hat Enterprise Linux Installation Guide. For 64-bit ARM servers, we recommend network installation (RHEL 7.5 is required). Instructions for making a bootable DVD or USB drive for 64-bit x86 systems can be found in the Red Hat Enterprise Linux Installation Guide. If you encounter difficulties at any point, see Troubleshooting and FAQ. Start the system from the bootable disk and select Install Red Hat Enterprise Linux. Note: you can skip the media checking step by hitting the Esc key. Select your preferred language and keyboard layout to use during installation. Under Localization review the settings and make any necessary changes for date and time, language, and keyboard layout. Note: The Done button to return to the Installation summary screen is located in the upper left corner of the screen. On the next screen, under Software selection, in the Base environment list on the left, select Server with GUI. In the list Add-ons for selected environment on the right, select Development tools. Click the Done button. Note: After returning to the Installation summary screen it will take several seconds to validate your choices. Click Installation destination to specify which disk or partition(s) to use for Red Hat Enterprise Linux. Note: It is important that you understand the choices that you are making in this section to avoid accidental data loss. It is strongly recommended that you read the Installation Destination section of the the Red Hat Enterprise Linux Installation Guide. The installation destination should be at least 20 GB or larger to accommodate the OS, graphical desktop, and development tools. Click Network & host name to configure the network. If the system has more than one network adapter, select it from the list on the left. Then click the On/Off button on the right to enable the network adapter. Click Configure to review and/or change the default settings for the network adapter. The default settings should be fine for most networks that use DHCP. Optionally, set a Host name for the system. Click Save to dismiss the network adapter configuration dialog. Before leaving the Network & Host name screen, make sure there is at least one network adapter enabled with the switch in the On position. A network connection will be required to register the system and download system updates. Click KDump to disable KDump and free up memory. Click the box next to Enable kdump so that it is no longer checked. Then click Done. Click the Begin installation button when you are ready to start the actual installation. On the next screen, while the installation is running, click User creation to create the user ID you will use to log in for normal work. Click Root password to set the password for the root user. Note: If you choose a password that the system considers to be weak, you will need to click Done twice. After the installation process completes, click the Reboot button. If you need help, see Troubleshooting and FAQ. Accept the license agreements and register the system with the Red Hat Subscription Management. Install the latest software updates. Add additional software repositories containing development software. 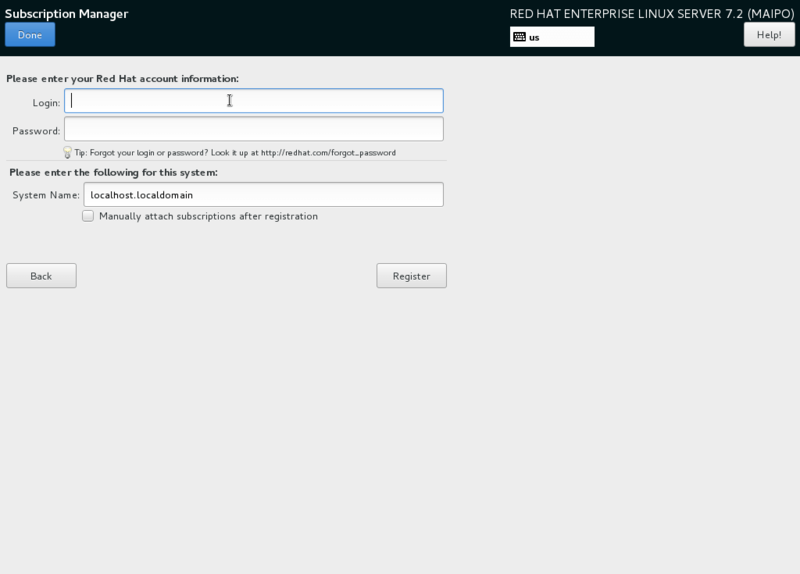 After installation, during the first boot of the system, you will be asked to accept the license agreement and register the system with Red Hat Subscription Management. Completing these steps are required for your system to download software from Red Hat. Note: In some cases, when booting the system for the first time, you may not see the graphical post-installation screen shown above. If you see a text-based license acceptance prompt follow the instructions in Complete installation and register the system (alternate) instead. Click License information to go the license acceptance screen. Click the check box to accept the license. Click Done in the upper left corner to return to the Initial Setup screen. If you didn’t configure a network during installation, click Network and host name to configure your network connection. 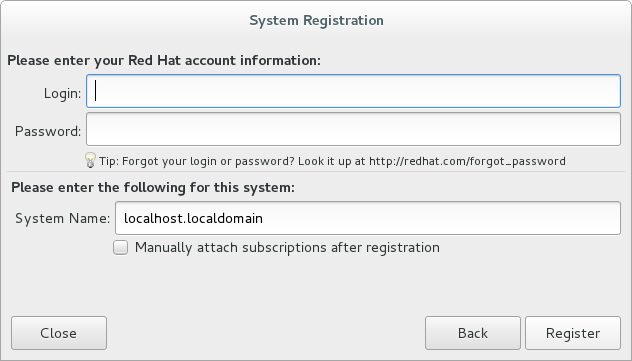 In the next step you will register your system with Red Hat and attach it to your subscription. Note: For this step to succeed, you must have successfully configured your network connection. Leave I will register with set to the default. Click Next to move the next screen. Enter your Red Hat username and password. This is the login that you use for Red Hat sites such as the Red Hat Customer Portal, access.redhat.com. Optionally, enter a System Name that will be used to identify this system on the Red Hat Customer Portal. On the next screen you will be shown the list of subscriptions that are available to your user ID. If you have more than one subscription available, select which subscription to attach this system to. Log in to the system with the username and password you created during installation. If you didn’t create a regular user, you will need to log in as root and create a user. See Troubleshooting and FAQ. If you get a text-based login screen instead of a graphical one, see Troubleshooting and FAQ. Select your preferred language for the GNOME desktop. Then click Next. Select your keyboard layout. Then click Next. Optionally follow the dialogs to connect your online accounts or click Skip. Click Start using Red Hat Enterprise Linux. You are now logged into Red Hat Enterprise Linux. The Getting Started page of the GNOME Help viewer is opened automatically as a full screen application after your first login. You may minimize, resize, or exit out of that application by using the window controls on the upper right corner. Enter 1 and hit return to enter the License information section. Enter 2 and hit return to accept the license agreement. Enter c and hit return to leave the License information section. Enter c and hit return to complete the initial setup. 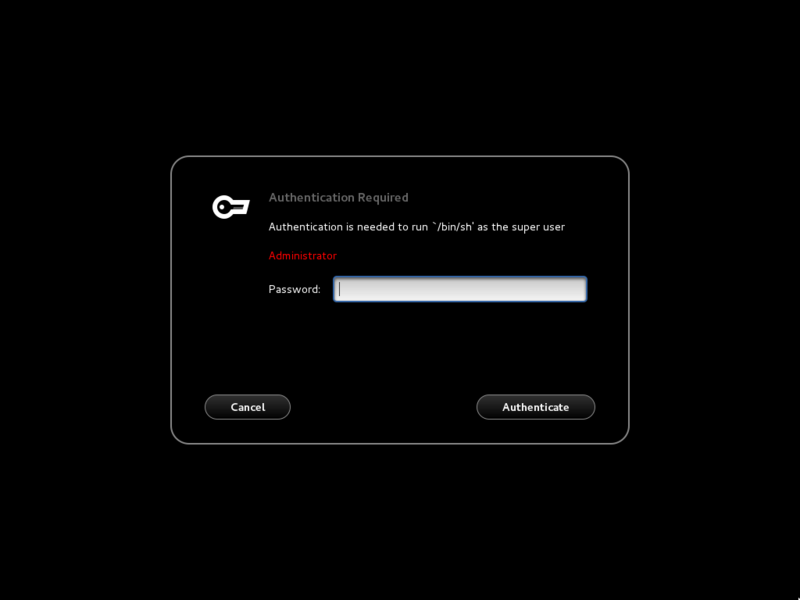 Log in to the system with the username and password you created during installation at the graphical login screen. If you didn’t create a regular user, you will need to log in as root and create a user. See Troubleshooting and FAQ. The Getting Started page of the GNOME Help viewer is opened automatically as a full screen application after your first login. You may minimize, resize, or exit out of that application by using the window controls on the upper right corner. 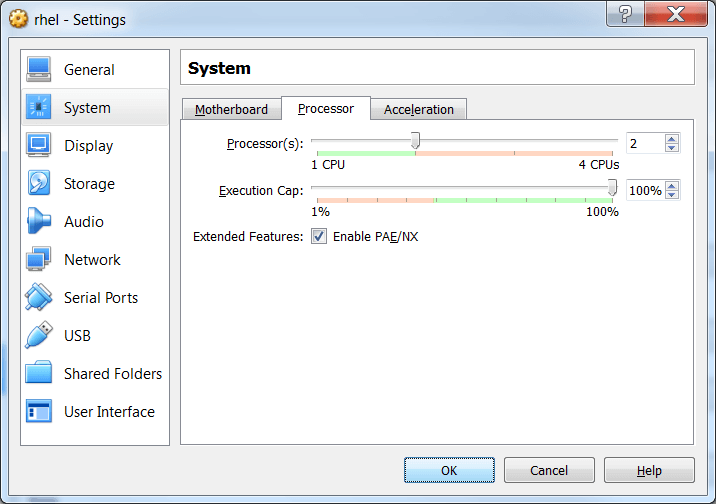 Run Settings from the System Tools group of the Applications menu. Click the Network icon under the Hardware group of All Settings. Make sure the toggle switch in the upper right is switched on. Check that the settings for IP address, default route, and DNS are appropriate for your network. If you need to change them, Click the settings button in the lower right corner. When you are finished with network settings close the window by clicking the X in the upper right corner. 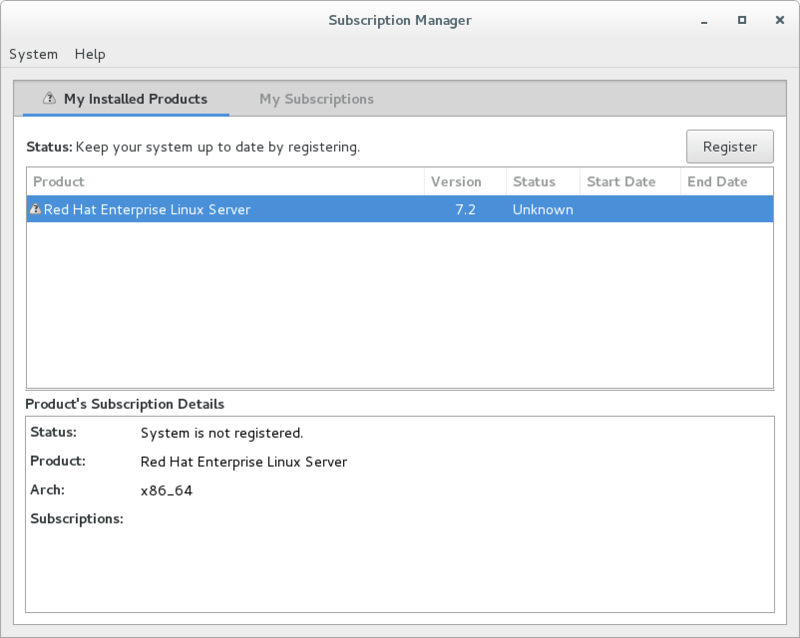 Start Red Hat Subscription Manager from the System tools group of the Applications menu. Click the Register button in the upper right corner of Subscription Manager. Leave I will register with set to the default on the System Registration dialog. Click Next to move the next dialog. On the next dialog, you will be shown the list of subscriptions that are available to for your Red Hat username. If you have more than one subscription available, select the subscription to attach this system to. 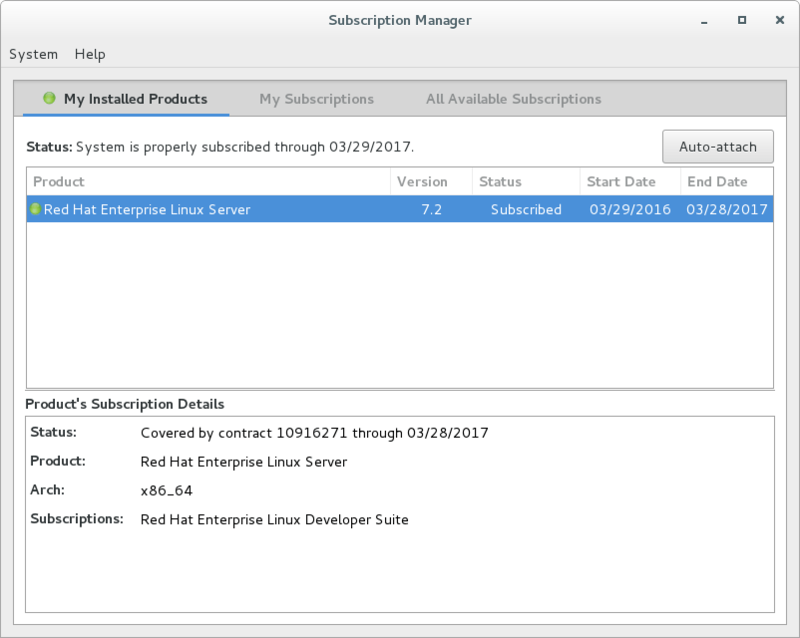 Click the X in the upper right hand corner to close Red Hat Subscription Manager. 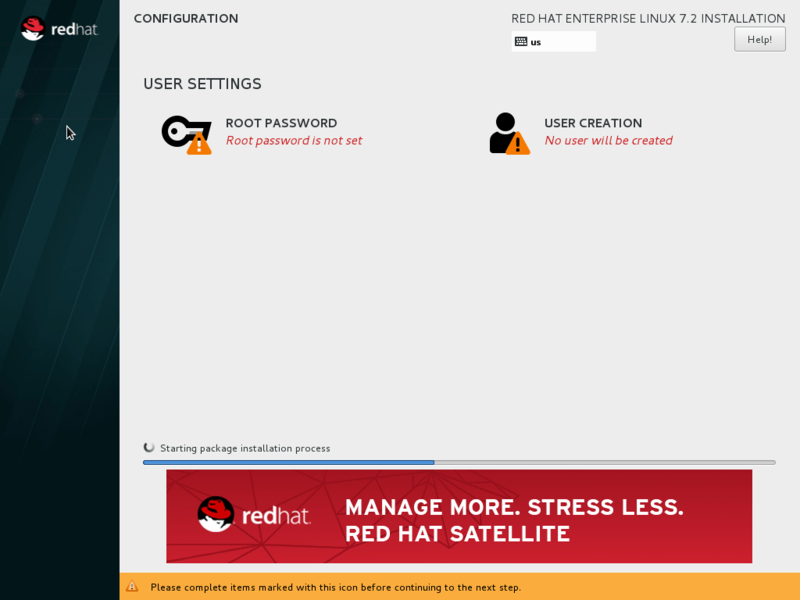 You are now ready to start using Red Hat Enterprise Linux. Next, install the latest updates. In this step, you will download and install the latest updates for your system from Red Hat. In the process, you will verify that your system has a current Red Hat subscription and is able to receive updates. First, start a Terminal window from the Application menu. 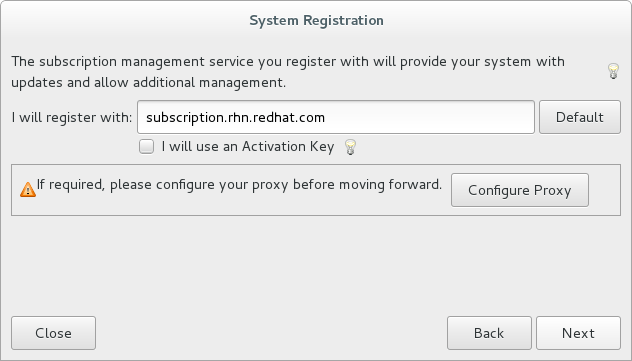 Then, after using su to change to the root user ID, use subscription-manager to verify that you have access to Red Hat software repositories. If you don’t see any enabled repositories, your system might not be registered with Red Hat or might not have a valid subscription. See Troubleshooting and FAQ for more information. Now download and install any available updates by running yum update. In this step you will configure your system to obtain software from the Optional RPMs and RHSCL software repositories. The Optional RPMs repository includes a number of development packages. The RHSCL repository includes the both Red Software Collections as well as Red Hat Developer Toolset (DTS). In this step you will select your programming language and then set up and run a simple application. You can a install languages, frameworks, and middleware by simply using yum install. For container development, a number of the development technologies are available as container images that can be installed with docker pull. Developed by the GNU project, the GNU Compiler Collection (GCC) includes front ends for C, C++, and Fortran. This step provides an overview of the key steps for installing Red Hat Enterprise Linux Server in a Hyper-V Virtual Machine (VM) so you can get started with software development. The VM you create will give you a Red Hat Enterprise Linux development environment that you can use on your system running Microsoft Windows 10, 8.1, or 8.0. Configure a VM to run Red Hat Enterprise Linux. Boot the VM using the ISO file you downloaded in step 1 as a virtual DVD. 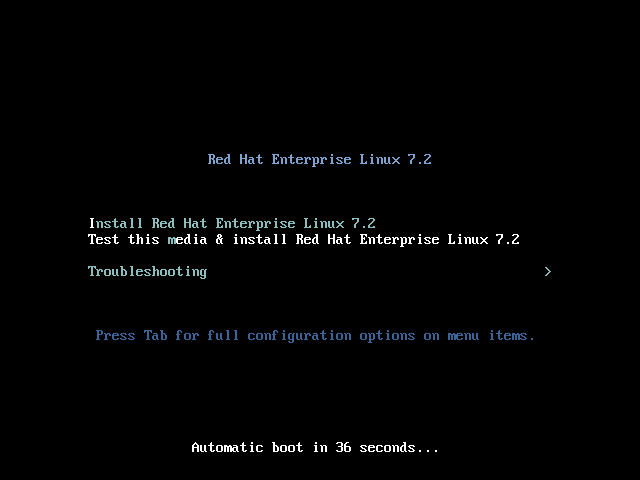 Install Red Hat Enterprise Linux. Note: This tutorial does not replace the Red Hat Enterprise Linux Installation Guide or Microsoft Hyper-V documentation. Instead, this tutorial provides an overview of the key steps for software developers. For detailed instructions, see the respective manual. You will be using the Server edition of Red Hat Enterprise Linux. This provides you with the widest range of software to develop and test with. The VM will have a full graphical desktop. You will select Server with a GUI during installation. After installation, you will configure additional software repositories that will provide you access to optional development software such as RHSCL and DTS. a 64-bit x86 machine with hardware virtualization assistance (Intel VT-X or AMD-V) and Second Level Address Translation (SLAT). Microsoft Windows 10, 8.1 or 8.0. 4 GB RAM (8 GB preferred). 24 GB of available disk space for the VM, the installation ISO file, and Hyper-V. If you encounter difficulties at any point in this tutorial, see Troubleshooting and FAQ. This guide shows the steps for Hyper-V on Windows 10 Professional. The steps Windows 8 and 8.1 are similar but may have small differences. Hyper-V is installed, but not enabled by default on most editions of Windows starting with Windows 8. Select Turn Windows Features on or off from the sidebar on the left. Select Hyper-V from the list in the Turn Windows features on or off dialog. 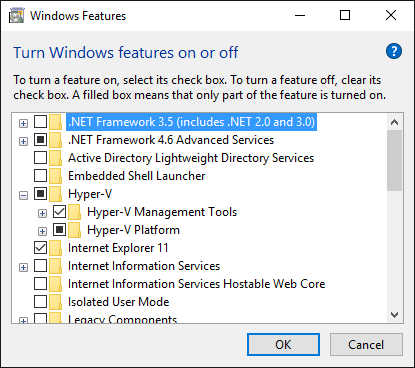 Click the Hyper-V check box. 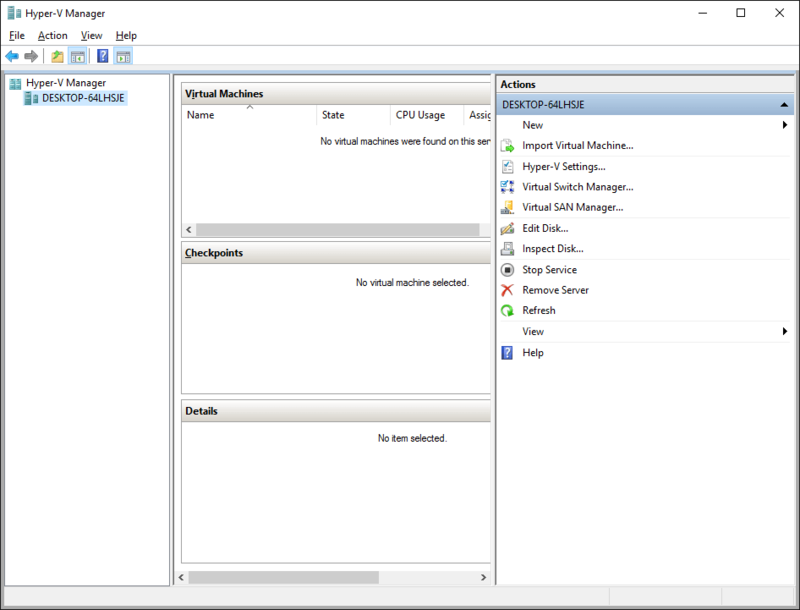 Click Hyper-V Management Tools to enable it. Ensure that Hyper-V Platform is checked. For more information see Install Hyper-V on Windows 10 or consult the documentation for your version of Microsoft Windows. Note: some of the Hyper-V documentation may be listed as "Client Hyper-V" since Hyper-V was originally a server feature. Intel and AMD processors have hardware extensions for accelerating virtualization. On some systems this support may be disabled by default in the system’s BIOS/UEFI. To enable the extensions, you might have to go into the system’s BIOS/UEFI setup configuration at boot time. Consult your system’s hardware documentation for more information. In this step, you will create and configure the VM that will run Red Hat Enterprise Linux. The physical system you are running Hyper-V on is called the host system or root partition. The VM is called the guest system or child partition. First, launch Hyper-V Manager from the Windows menu. 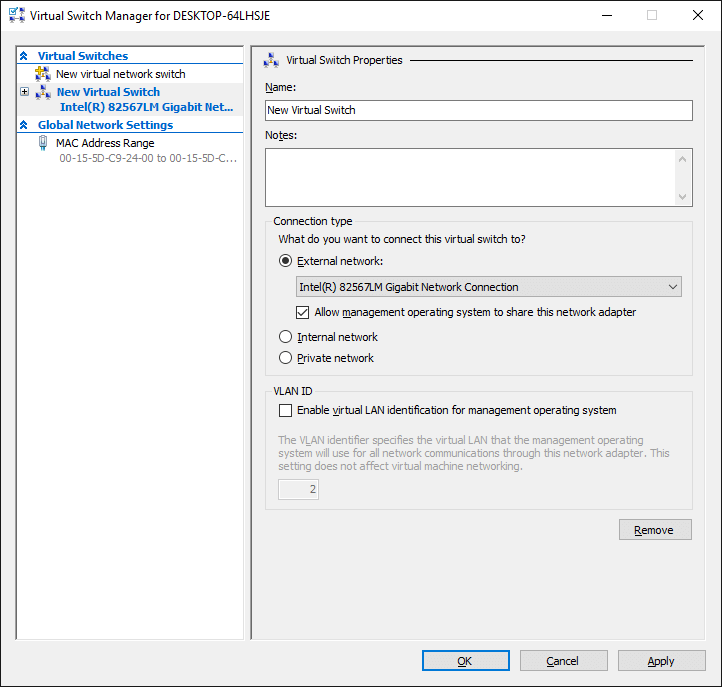 Click Virtual Switch Manager…​ in the right Actions pane. Click External under What type of virtual switch do you want to create?. Optionally, enter a name for the virtual switch. Make sure that External network is checked. If your system has more than one network adapter, such as wired and wireless, choose which network adapter the virtual switch is connected to. Click Yes in the Apply Networking Changes dialog that warns about disrupting your network connection while making this change. Click Next to skip past the Before You Begin section. 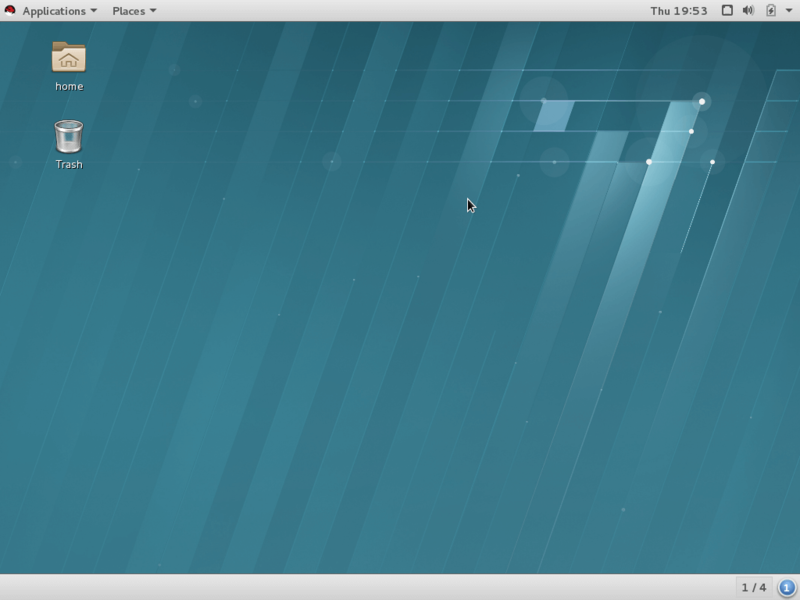 Enter rhel as the Name of the VM. Change the location to store the VM’s files if necessary. The default is C:\ProgramData\Microsoft\Windows\Hyper-V\. Note: you will be prompted later for the location of the VM’s virtual hard disk. make sure Generation 1 is checked. Under Assign Memory, set the amount of memory available to the VM. The minimum is 2048 MB, however 4096 MB is suggested. Select the virtual switch you created earlier from the Connection list. 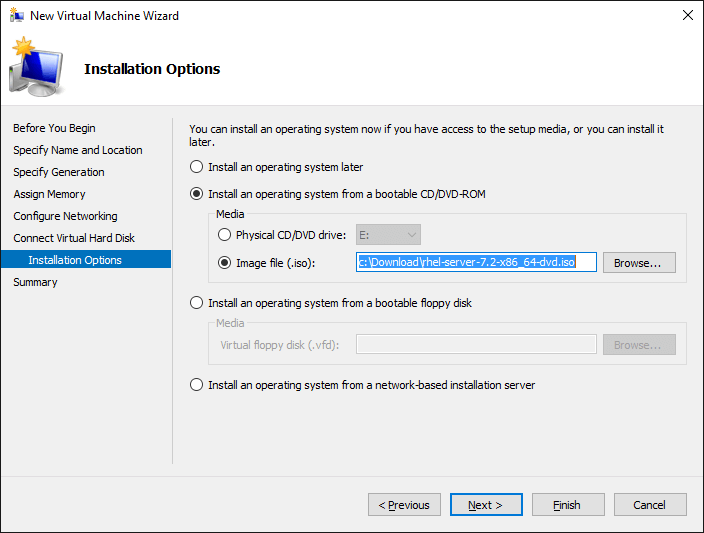 Under Connect Virtual Hard Disk you will configure the new VM’s virtual hard disk (VHD). You will need at least 20 GB of free space to store the VM’s VHD. While this setting can be changed later, it is a multi-step process not covered by this guide. Therefore it is recommended that you size the VHD to be large enough for your software development activities. Select Create a virtual hard disk if it isn’t already checked. 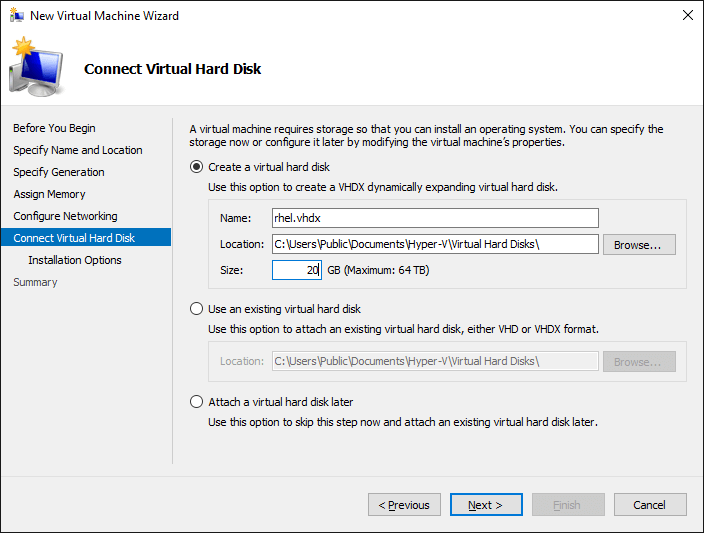 Enter rhel.vhdx as the Name of the virtual hard disk. Change the Location if necessary. By default the VHD will be stored in C:\Users\Public. Set the size to 20 GB or larger. Select Install an operating system from a bootable CD/DVD-ROM. Click Browse…​ to navigate to the Red Hat Enterprise Linux Server DVD .iso file you downloaded in step 1. Check your settings on the Summary dialog. Then, click Finish to create the VM. 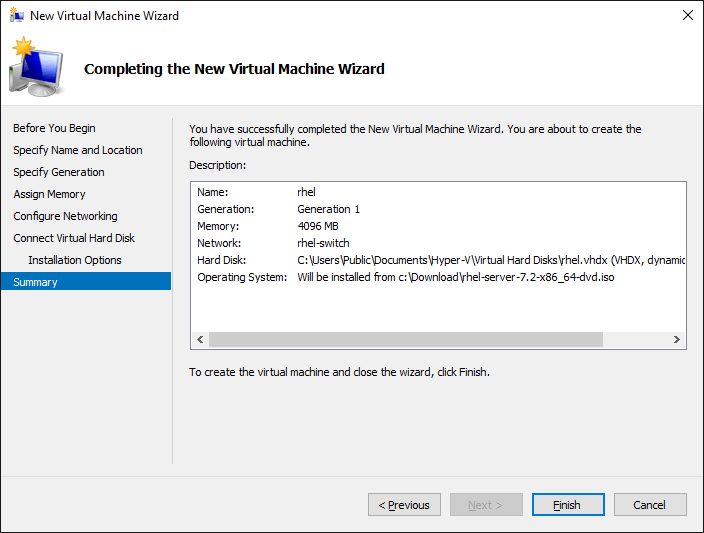 To start the VM and begin installation, start Hyper-V Manager if it isn’t already running, then locate the rhel VM in the Action pane on the right and click Start. The VM should now boot up from the Red Hat Enterprise Linux Server DVD. This section provides a brief overview of the steps for installing Red Hat Enterprise Linux. Detailed instructions can be found in the Red Hat Enterprise Linux Installation Guide. The Installation destination will be the virtual hard disk you created for the VM. Select Server with a GUI under Software Selection so the system will boot into the full graphical environment after installation. 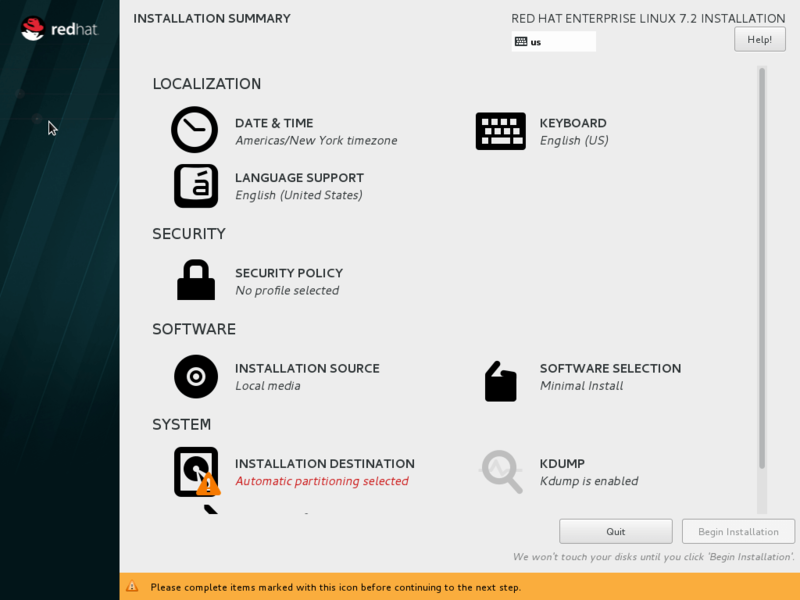 By default, Red Hat Enterprise Linux Server will not install a graphical desktop. Click Installation destination to specify the disk/partition to use. On the Installation Destination screen, under Local Standard Disks, make sure the one disk is checked. This is the virtual hard disk you created earlier. Click Network & host name to configure the network. If the system has more than one network adapter, select it from the list on the left. Then click the On/Off button on the right to enable the network adapter. Click Configure to review and/or change the default settings for the network adapter. Optionally, set a Host name for the system. Before leaving this screen, make sure there is at least one network adapter enabled with the switch in the Onposition. A network connection will be required to register the system and download system updates. Proceed to Disable lock screen and screen power saving. 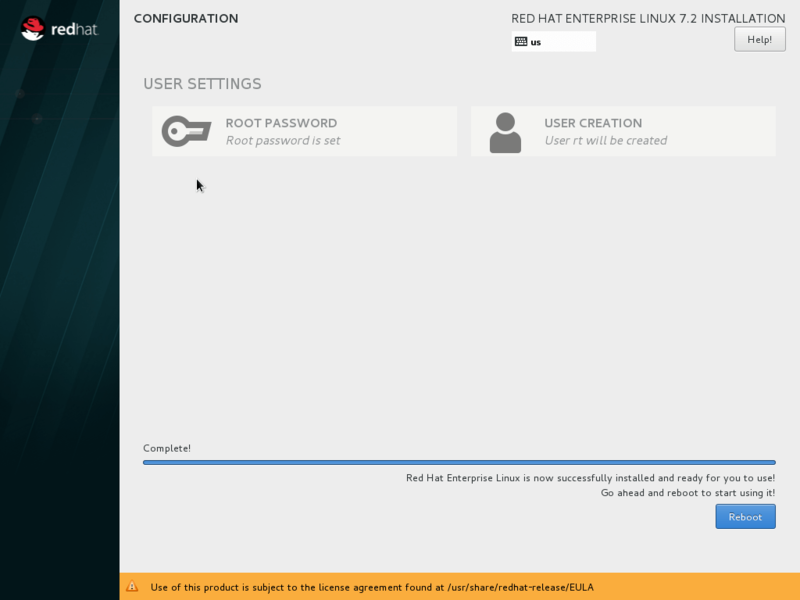 For security and to save energy, the default configuration of Red Hat Enterprise Linux is to lock the screen and turn the screen off when idle. On a VM, it is best to disable these features since the host system will control screen locking and power saving. To disable these features, from the desktop Application menu, select the System Tools group, then select Settings. Follow these steps in the Settings application. Click the Privacy icon to bring up the Privacy dialog. Click on Screen Lock to bring up the Screen Lock dialog. Click on the On/Off switch to the right of Automatic Screen Lock. Click the X in the upper right hand corner to dismiss the Screen Lock dialog. Click the < button in the upper left corner of the Privacy dialog to go back to the main Settings screen. Click on the Power icon to open the Power settings dialog. Click the menu button to the right of Blank screen. Select Never from the list of choices. Finally, Click the ‘X’ in the upper right hand corner to close the Settings application. In this step you will configure your system to obtain software from the Optional RPMs and RHSCL software repositories. The Optional RPMs repository includes a number of development packages. The RHSCL repository includes the both the RHSCL software collections as well as DTS (the Red Hat Developer Toolset). 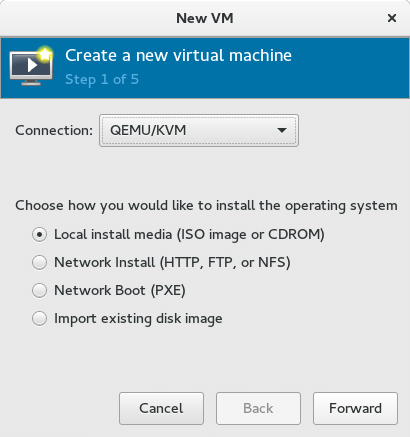 This step provides an overview of the key steps for installing Red Hat Enterprise Linux Server in a Virtual Machine (VM) running on your Linux system using KVM/libvirt virtualization. The VM you create will give you a Red Hat Enterprise Linux development environment that will run on Fedora, CentOS, Ubuntu, or other Linux. Instructions are shown for Fedora 23 and Ubuntu 14.04, however these steps should work on other Linux distributions that include KVM and libvirt tools including virt-manager. Note: This tutorial does not replace the Red Hat Enterprise Linux Installation Guide or your system’s virtualization documentation such as the Fedora Virtualization Getting Started Guide. Instead, this tutorial provides an overview of the key steps for software developers. For detailed instructions, see the respective manual. 24 GB of available disk space for the VM and the installation ISO file. Install the KVM and virtualization tools for your Linux system. Then, start libvirtd. Note: you will need to log out and back in again for the group change to take affect. In this step you will create and configure the VM that will run Red Hat Enterprise Linux. The physical system you are running KVM/libvirt on is called the host system. The VM is called the guest system. Instructions are provided for creating the VM using the virt-manager or from the command line using virt-install. 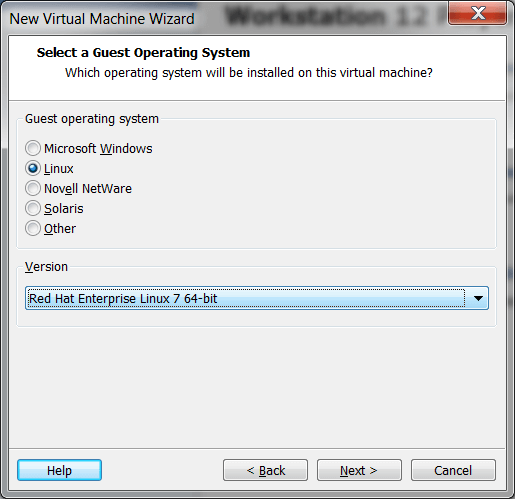 Use the following command to create a VM and start installing Red Hat Enterprise Linux. Note: you need to run virt-install as the root user. After creating the VM, virt-install will automatically start virt-viewer to give you access to the VM’s console. Proceed to Install Red Hat Enterprise Linux. To create a VM using the virt-manager GUI, start Virtual Machine Manager from the system menu or enter the command virt-manager. Select New Connection from the File menu. 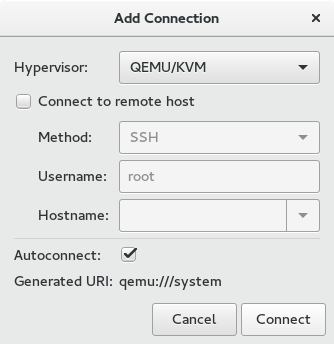 Select QEMU/KVM from the list of hypervisors. Select New Virtual Machine from the File menu. Make sure Connection is set to QEMU/KVM. Select Local install media (ISO image or CDROM) under Choose how you would like to install the operating system. Click Browse Local on the bottom of the Choose Storage Volume dialog. Navigate to the Red Hat Enterprise Linux Server DVD .iso file you downloaded in step 1 of this guide. Uncheck Automatically detect operating system based on install media. Set OS Type to Linux. Set Version to Red hat Enterprise Linux 7. If that choice is not available, you may select Red Hat Enterprise Linux 6. 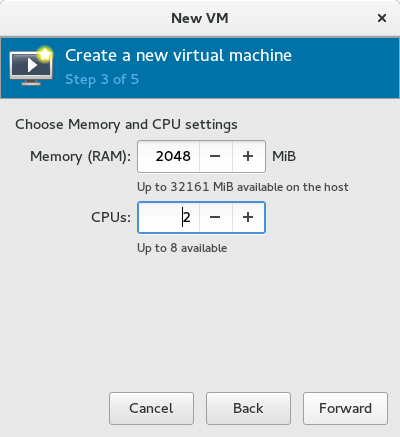 Set the amount of memory available to the VM. The minimum is 2048 MB, however 4096 MB is suggested. Optionally, set the number of CPUs available to the VM. 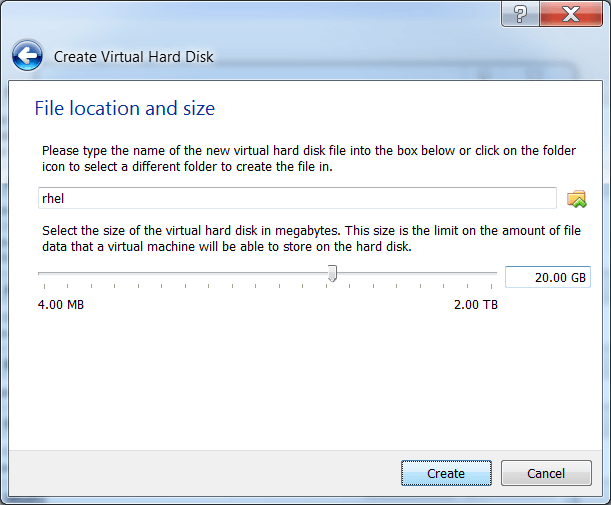 On the next dialog you will specify the virtual hard disk (VHD) size. The size of the VHD, should be a minimum of 20 GB. While this setting can be changed later, it is a multi-step process not covered by this guide. Therefore it is recommended that you size the VHD to be large enough for your software development activities. Check Enable storage for this virtual machine. 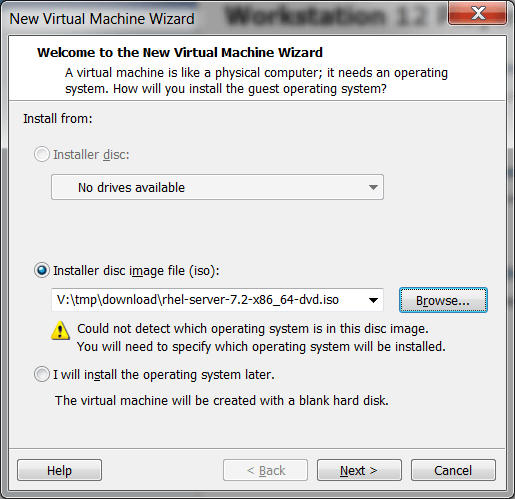 Check Create a disk image for the virtual machine. Set the desired VHD size. Set the Name to rhel. The newly created VM will now boot up from the .iso file to start the installation. When you click inside the VM window, the mouse pointer and keyboard will be captured by the VM until you release them by hitting the left Ctrl and Alt keys at the same time. After the installation of Red Hat Enterprise Linux completes, the integration the of mouse pointer will be improved. You will no longer need to hit the left Ctrl and Alt keys to move the focus outside of the VM window. Tools for libvirt such as virt-manager and virt-viewer can work with VMs running on the local machine as well as remote systems. You may need to specify which hypervisor to connect to, QEMU/KVM in the virt-manager GUI, or -c qemu:///session for command line line tools such as virt-viewer. 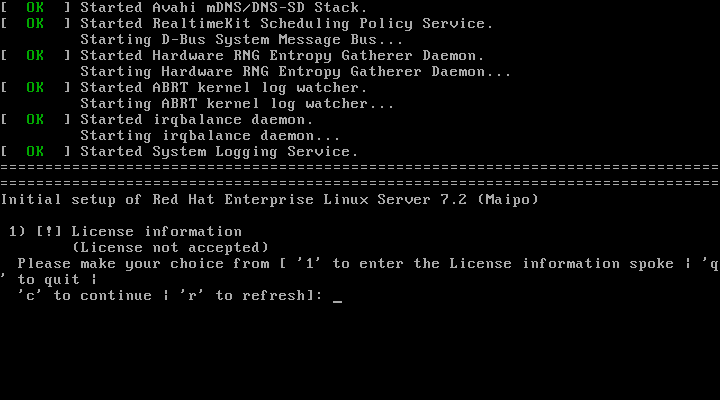 When the VM boots, select Install Red Hat Enterprise Linux. On the Installation Destination screen, under Local Standard Disks, make sure the disk sda is checked. This is the virtual hard disk you created earlier. Accept the license agreements and register the system with the Red Hat Subscription Management.. The default network configuration is for the VM to share the host system’s network connection(s) and IP address using network address translation (NAT). This is the easiest to manage and will be fine for many uses. Using NAT, the VM will be able to access resources on your network or the Internet. However services, such as a web server, running inside the VM won’t be directly accessible from outside of the VM. Alternatively, you can attach the VM to directly network by sharing the network adapter from the host system as a bridged network adapter. In this configuration, the VM gets its own IP address, usually using your network’s DHCP server. The VM appears on the network the same way a physical computer would with its own hardware MAC address. The host’s network adapter is shared by creating a network bridge. The VM’s virtual network adapter can only be bridged to one physical network adapter at a time. If your system has more than one network adapter you need to choose which one to attach to. If your system switches between wired and wireless connections, you will need to switch bridged adapters for the VM. Networking, both physical and virtual, is a large topic beyond the scope of this guide. For more information see your system’s documentation. 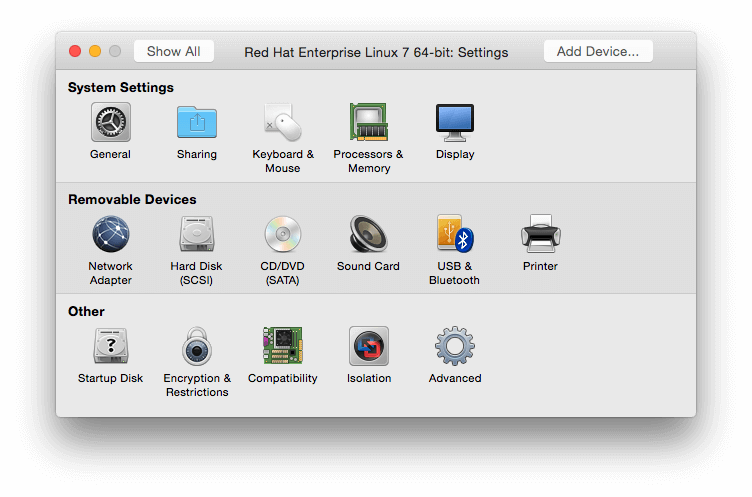 This step provides an overview of the key steps for installing Red Hat Enterprise Linux Server in a VirtualBox Virtual Machine (VM) so you can get started with software development. The VM you create will give you a Red Hat Enterprise Linux development environment that you can use on your system running Microsoft Windows, Mac OS X, Ubuntu, or other Linux. Note: This tutorial does not replace the Red Hat Enterprise Linux Installation Guide or VirtualBox User Manual. Instead, this tutorial provides an overview of the key steps for software developers. For detailed instructions, see the respective manual. An operating system supported by VirtualBox such as Microsoft Windows 7 or later, Apple Mac OS X 10.8 or later, Ubuntu Linux 12.04 or later. 24 GB of available disk space for the VM, the installation ISO file, and VirtualBox. This guide uses VirtualBox is 5.0.x. You may also use VirtualBox 4.3.x though there will be some minor differences from what is described here. Older versions of VirtualBox may work but have not been tested. Go to the VirtualBox Download page and download the installer for your system. After the download completes, click on the downloaded .exe or .dmg file to start the installation. During the installation you will need to agree to using administrative privileges for a number of the steps. If your distribution doesn’t include VirtualBox packages or the packages are older than VirtualBox 4.3.x, see the VirtualBox for Linux download page to download a package for your system. A extension package is available for VirtualBox that provides support for USB devices, remote desktop access via RDP, and PXE boot. The software is provided in binary form as it is not open-source. 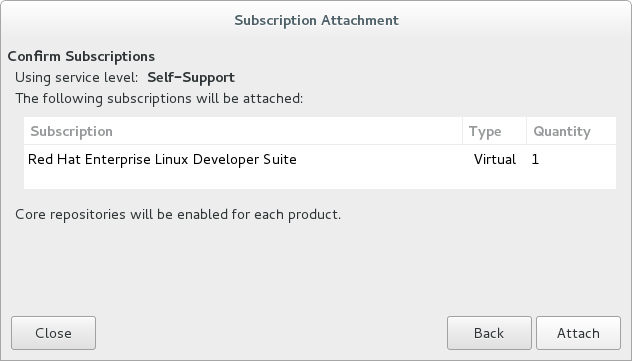 The extension package is available on the VirtualBox Download page. On some Microsoft Windows systems it may be necessary to disable Microsoft Hyper-V virtualization in order to use VirtualBox. Only one virtualization platform, or hypervisor, can be active on a host system at a time. While hypervisors like VirtualBox only take control of the host system’s hardware virtualization capabilities when they are actually running a VM, Microsoft Hyper-V takes control at boot time. In order to use VirtualBox, Hyper-V must either be disabled or uninstalled. Consult Microsoft’s documentation for more information. Note: if you are interested in using Microsoft Hyper-V instead of VirtualBox, follow the steps in the Hyper-V tab at the top of this page. In this step you will create and configure the VM that will run Red Hat Enterprise Linux. The system you are running VirtualBox on is called the host system. Note: VirtualBox refers to the VM running Red Hat Enterprise Linux as the guest system. 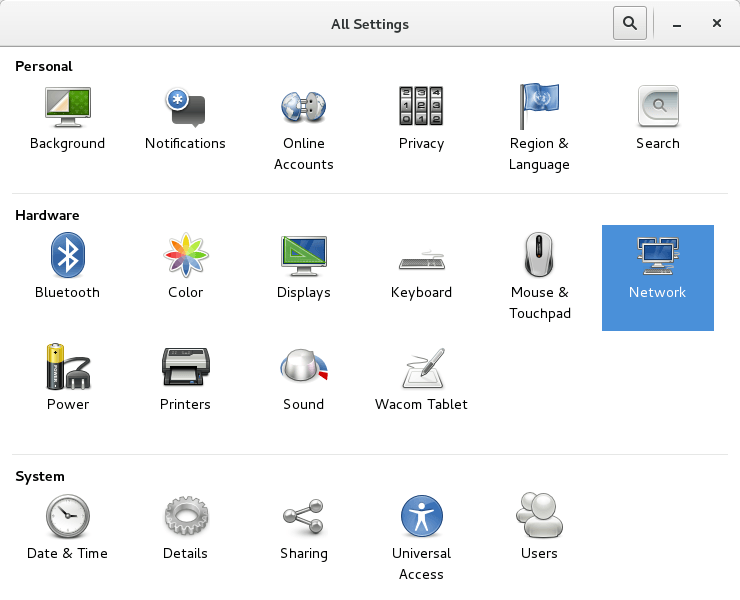 However, most of the options to control the VM are under the Machine menu entry. First, launch VirtualBox from your system’s menu. On some systems, the menu entry will be called Oracle VM VirtualBox. 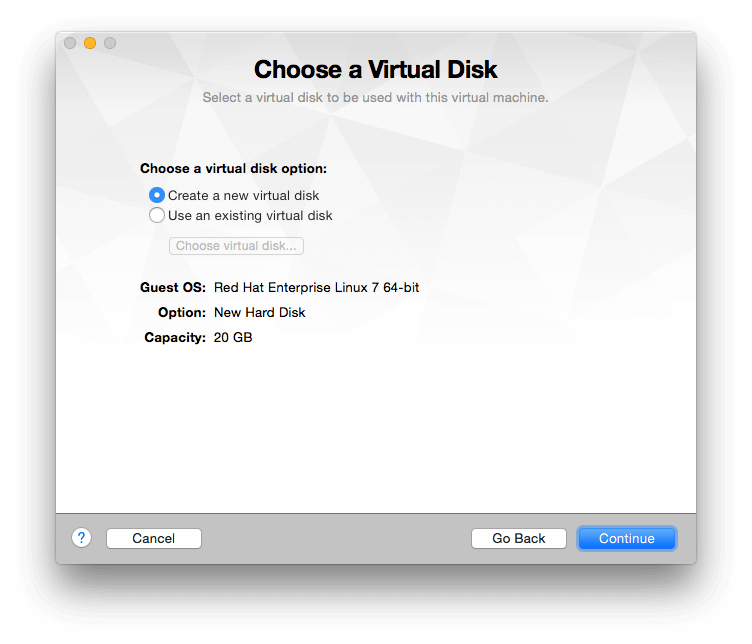 Before you create any VMs, you may wish to change where VirtualBox stores the files that are used as virtual hard disks for the VMs you create. By default, VirtualBox places these files in your home directory. You will need at least 20 GB of available space. To change the location, select Preferences from the File menu. Under General, change Default Machine Folder to your preferred location. Enter RHEL as the name or part of the name. This will be the name of the created VM in VirtualBox. Including RHEL will automatically set VM Type and Version. Ensure that Type is set to Linux and Version is set to Red Hat (64-bit). Set the VM memory size to at least 2048 MB on the Memory size dialog. This value can be changed later. The minimum you should use is 2048 MB, however 4096 MB is suggested. Then, click Next. Select Create a virtual hard disk now on the Hard disk dialog. Then, click Create to move to the next dialog. 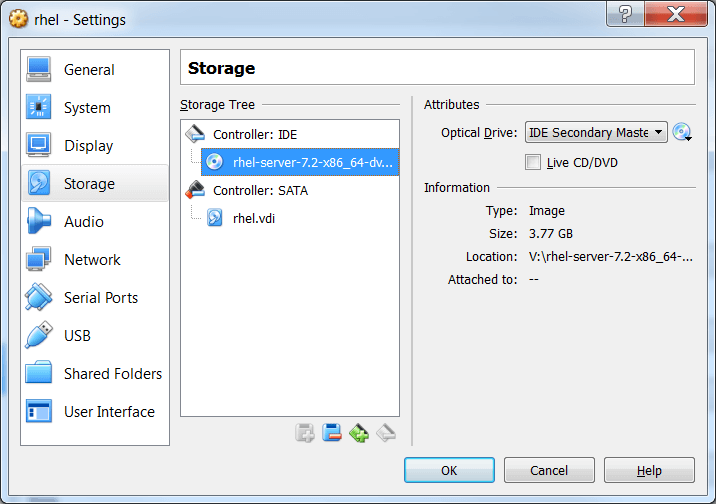 Select VDI (VirtualBox Disk Image) on the Hard disk file type dialog. Then, click Next. 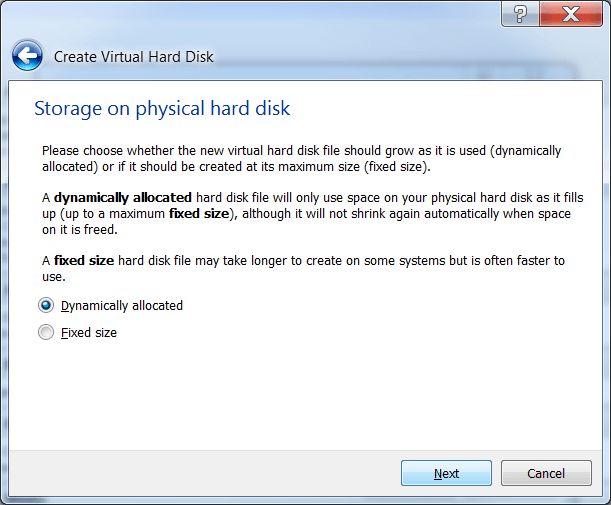 Select Dynamically allocated on the Storage on physical hard disk dialog. Then, click Next. Change the name and location if desired. Set the size to be a minimum of 20 GB. Select the General group, then click the Advanced tab. 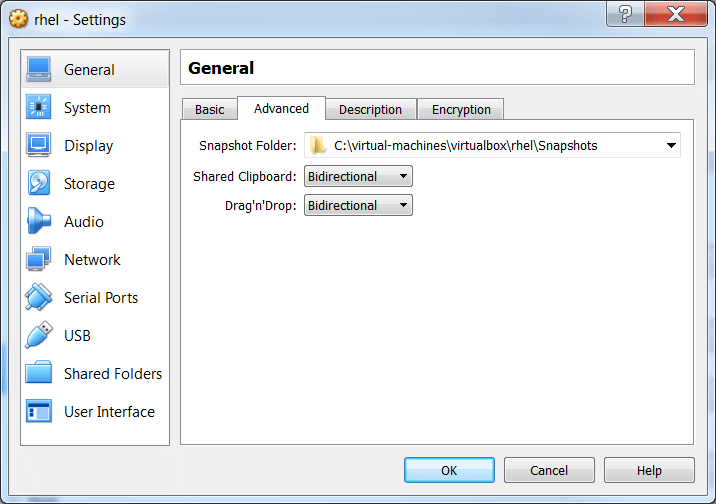 Enable copy-and-paste between the host system and the VM by setting Shared Clipboard and Drag’n’Drop to Bidirectional. Note: copy-and-paste will only be available after VirtualBox Guest Additions are installed on the VM during step 3. By default, the VM will have a single virtual processor. If your system has multiple processors or cores, you can add more. Select the System group, then click the Processor tab. Adjust Processors to the desired value. In the Network group, under the Adapter 1 tab, you can configure the VM’s networking configuration. The default is Network Address Translation (NAT) which is recommended because it is the easiest to manage. You may want to choose Bridged to attach the VM directly to the physical network. See VirtualBox Networking below for more information. 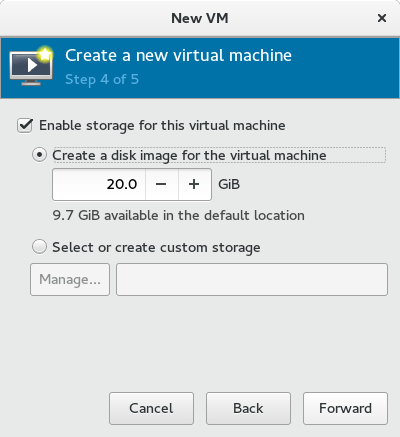 Select the Storage section of the VM Settings dialog. Under Controller: IDE, select the CD icon that says Empty next to it. On the right side, under Attributes, click the CD icon on the far right. Select Choose Virtual Optical Disk File. Navigate to the Red Hat Enterprise Linux Server binary DVD ISO file that you downloaded earlier. Click OK to close the VM settings dialog. You may create a folder that is shared between your host system and the Red Hat Enterprise Linux VM. This makes it easy to share files such as source code between the two systems. The configuration for shared folders can be performed now or anytime later. Shared folders will only be available on the VM after the VirtualBox Guest Additions software is installed on the VM. Installation of VirtualBox Guest Additions is covered in step 3 with the other Red Hat Enterprise Linux post-installation steps. 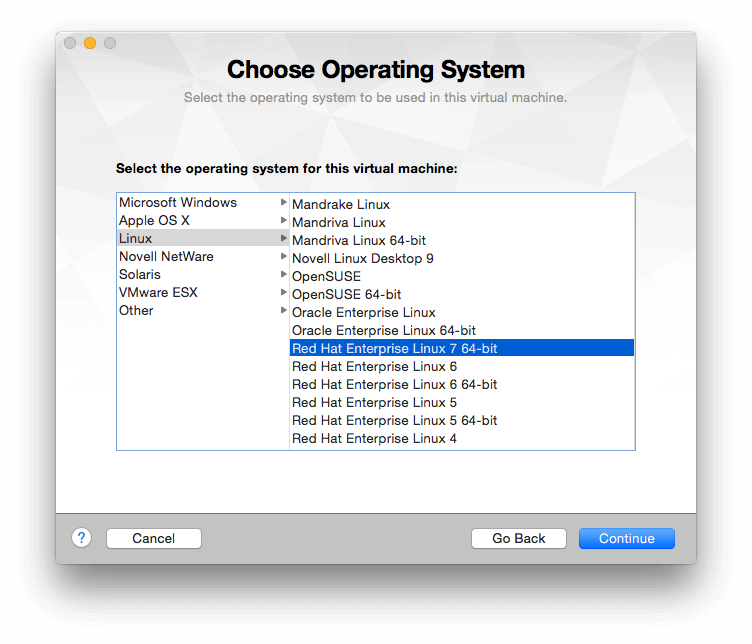 Select your RHEL VM in VirtualBox, the click the Settings button. Select the Shared Folders group. Click the folder icon with a + in the upper right corner. Enter the path on the host system in the Folder Path. Enter a name without spaces for the shared folder on the VM. The path to shared folders on the VM will be /media/sf_<foldername>. When you click inside the VM window, the mouse pointer and keyboard will be captured by the VM until you release them by hitting the Host Key. The lower right corner of the VirtualBox window shows which key is the Host Key for your OS. On Windows and Linux it is the right Ctrl key. On Mac OS is it the left Command (⌘) key. After you install VirtualBox Guest Additions, the integration the of mouse pointer will be improved. You will no longer need to hit the Host Key to move the focus outside of the VM window. VirtualBox will display some pop-up messages in the VM window. You can dismiss those after to reading them. Note: you won’t be able to click on the pop-up messages if your mouse pointer is captured by the VM. Hit the Host Key to release the pointer, then click to dismiss the pop-up boxes. For more information see Chapter 1. First steps in the VirtualBox User Manual. 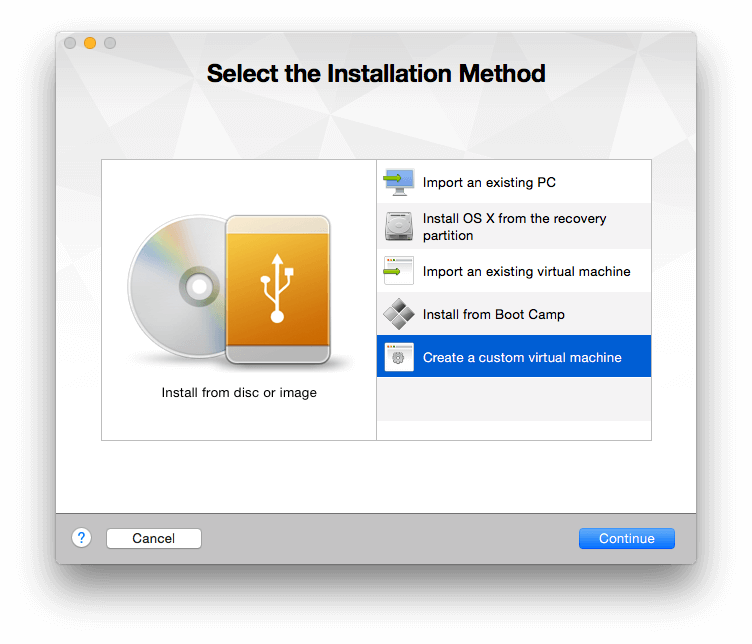 To start the VM and begin installation, start VirtualBox if it isn’t already running, then select your VM and click the Start button. 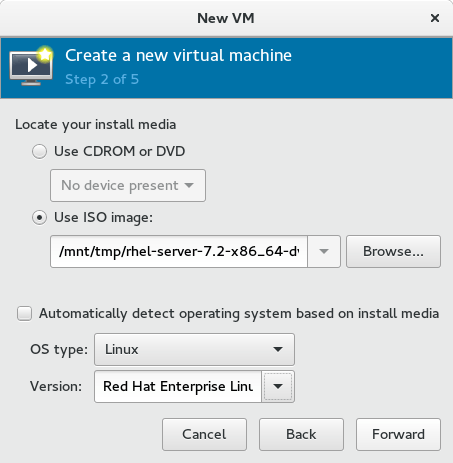 The VM should now boot up from the Red Hat Enterprise Linux Server DVD. Install the latest software updates and VirtualBox Guest Additions. Note: In some cases, when booting the system for the first time, you may not see the graphical post-installation screen shown above. If you see a text-based license acceptance prompt follow the instructions in Complete installation and register the system (alternate)Complete installation and register the system (alternate)>> instead. Better mouse pointer integration that eliminates the need to capture the pointer within the VM. Copy and paste between the VM and the host system. Folders that are shared from the host system to the VM. This can be helpful for making your source code available on the VM. Ability to dynamically resize the VM’s window which will change the size of the graphical desktop inside the VM. 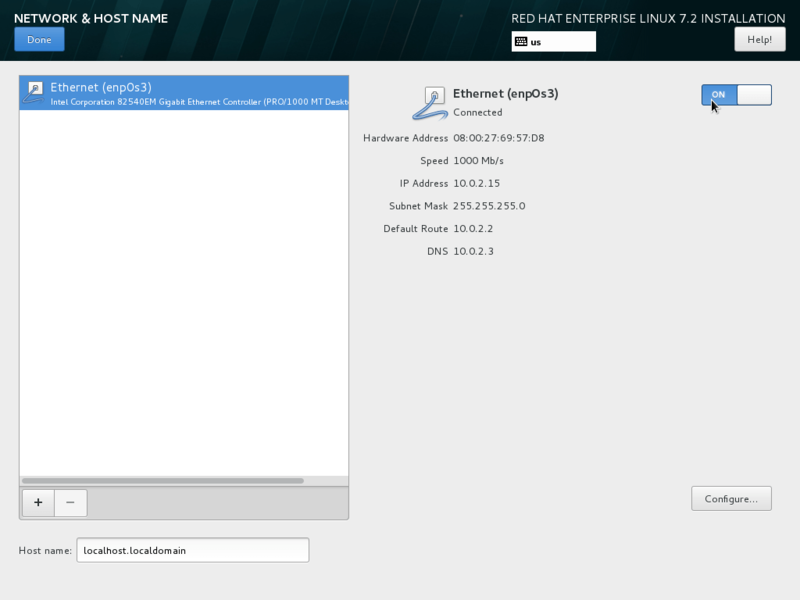 You need to be logged into Red Hat Enterprise Linux with the graphical desktop running. You need to have installed Development Tools during installation. The development tools are used to compile the VirtualBox drivers. Select Insert Guest Additions CD image from the Devices menu of the VM window. A dialog box will pop up asking you if you want to run the software on the virtual CD. Click Run. Enter the password for the root user when prompted. Then click Authenticate. A Terminal window will appear with the install process running inside of it. When the process it complete you will be prompted to hit Return to close the window. Eject the virtual CD by right clicking on its icon on the desktop and selecting Eject. Note: If you upgrade VirtualBox on your host system, you will need to repeat these steps. The default VirtualBox network configuration is for the VM to share the host system’s network connection(s) and IP address using network address translation (NAT). This is the easiest to manage and will be fine for many uses. Using NAT, the VM will be able to access resources on your network or the Internet. However services, such as a web server, running inside the VM won’t be directly accessible from outside of the VM. You can make specific services on the VM accessible using port forwarding. For example you can configure port forwarding so that port 8080 on your host system maps to port 80 on the VM. Alternatively, you can attach the VM to directly network by sharing the network adapter from the host system as a bridged network adapter. In this configuration, the VM gets its own IP address, usually using your network’s DHCP server. The VM appears on the network the same way a physical computer would with its own hardware MAC address. The host’s network adapter is shared by a device driver that is installed by VirtualBox. The VM’s virtual network adapter can only be bridged to one physical network adapter at a time. If your system has more than one network adapter you need to choose which one to attach to. If your system switches between wired and wireless connections, you will need to switch bridged adapters for the VM. Networking, both physical and virtual, is a large topic beyond the scope of this guide. For more information see Virtual Networking in the VirtualBox User Manual. 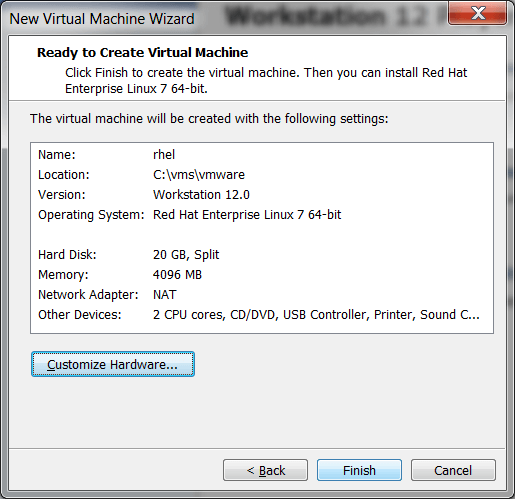 This step provides an overview of the key steps for installing Red Hat Enterprise Linux Server in a VMware Virtual Machine (VM) so you can get started with software development. The VM you create will give you a Red Hat Enterprise Linux development environment that you can use on your system running Microsoft Windows or Mac OS X. Note: This tutorial does not replace the Red Hat Enterprise Linux Installation Guide or VMware documentation. Instead, this tutorial provides an overview of the key steps for software developers. For detailed instructions, see the respective manual. 24 GB of available disk space for the VM, the installation ISO file, and VMware. Microsoft Windows: VMware Workstation Pro or VMware Workstation Player. Apple Mac OS X: VMware Fusion or VMware Fusion Pro. After the download completes, click on the downloaded .exe or .dmg file to start the installation. During the installation you will need to agree to using administrative privileges for a number of the steps. The Windows enhanced virtual keyboard driver is not required. You may install it if needed for improved support of international keyboards. Note: This guide uses VMware Workstation 12 and VMware Fusion 8. Older versions may work but the steps might be slightly different. On some Microsoft Windows systems it may be necessary to disable Microsoft Hyper-V virtualization in order to use VMware. Only one virtualization platform, or hypervisor, can be active on a host system at a time. While hypervisors like VMware only take control of the host system’s hardware virtualization capabilities when they are actually running a VM, Microsoft Hyper-V takes control at boot time. In order to use VMware, Hyper-V must either be disabled or uninstalled. Consult Microsoft’s documentation for more information. Note: if you are interested in using Microsoft Hyper-V instead of VMware, follow the steps in the Hyper-V tab at the top of this page. In this step you will create and configure the VM that will run Red Hat Enterprise Linux. The system you are running VMware on is called the host system. The operating system running inside the VM is referred to as the guest. First, launch VMware from your system’s menu. The follow the steps for your operating system. Click Browse, then locate the ISO file you downloaded in step 1. Select Red Hat Enterprise Linux 7 64-bit from the list of choices under Version. 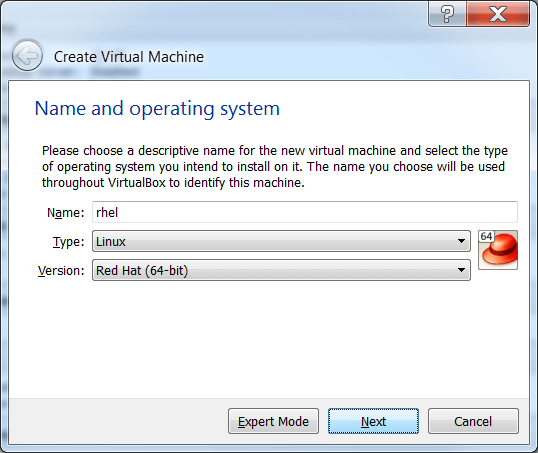 Enter rhel or your preferred name in the Virtual machine name box. Change the location of the VMs files, including the virtual hard disk if necessary. By default it will be placed in your Documents folder. You will need 20 GB of space in the chosen location. Change the Maximum disk size (GB) if needed. The default is 20 GB. Adjust the amount of Memory (RAM) if desired. A 2 GB or more is suggested for development. 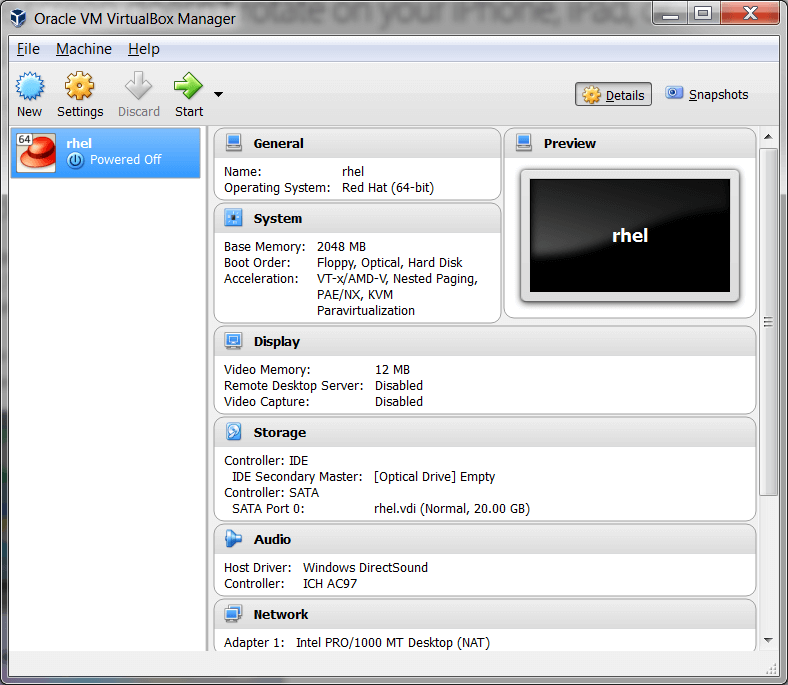 By default, the VM will have a single virtual processor. If your system has multiple processors or cores, you can add more to the VM. Under Network Adapter, you can set the VM’s networking configuration. The default is Network Address Translation (NAT) which is recommended because it is the easiest to manage. You may want to choose Bridged to attach the VM directly to the physical network. See VMware Networking below for more information. Click OK to close the Virtual Machine Settings dialog. 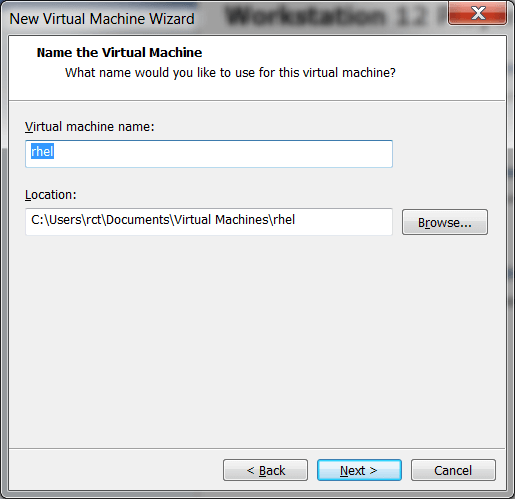 Click Create a custom virtual machine on the Select the Installation Method dialog. Then, click Continue. Select Linux on the left side of the Choose Operating System dialog. Select Red Hat Enterprise Linux 7 64-bit from the list on the right. 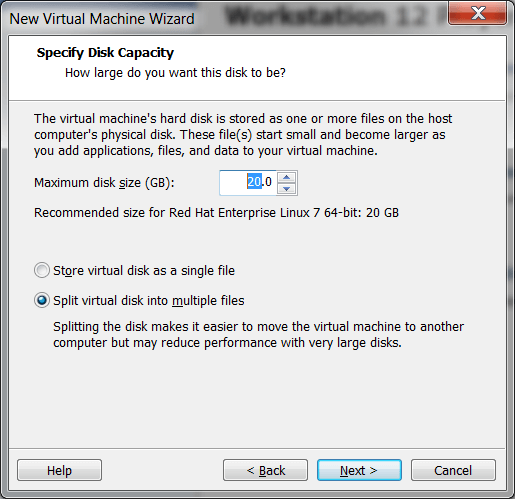 Click Continue on the Choose a Virtual Disk dialog. The option Create a new virtual disk should be selected by default. The default virtual disk size is 20 GB. Choose the name and location to start the VM files. Note: By default it will be placed in your Documents folder. You will need at least 20 GB of space in the chosen location. Set the VM name to rhel in the Save As box. Change the location for the files in the Where box if needed. At this point the basic VM configuration has been completed, but some additional configuration is needed. Click the Settings button (wrench icon), or select Settings from the Virtual Machine menu. Click the CD/DVD icon in the VM Settings dialog. Select Choose a disk or disk image…​ from the CD/DVD dialog. By default it is set to Autodetect. In the file dialog, Navigate to the location of the .iso file you downloaded in step 1. Then click Open. Click the Connect CD/DVD Drive check box. Click Show All in the top left corner to return to VM Settings. Optionally, you can tailor the configuration of the VM to suit your needs. 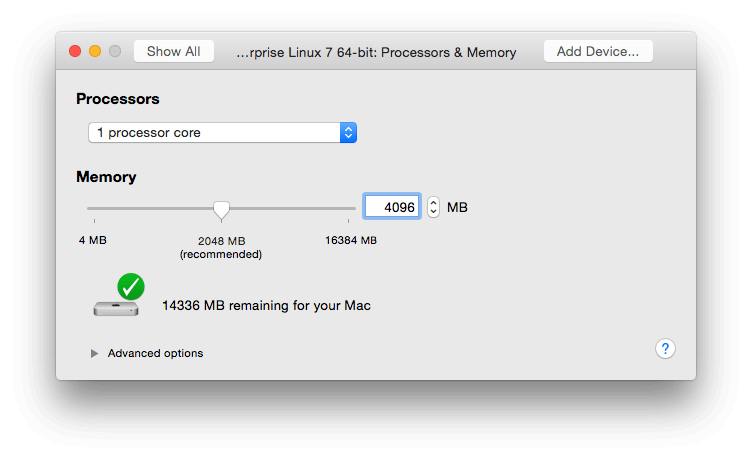 You can adjust the amount of memory and number of CPUs available to the VM by clicking the Processors & Memory icon. The minimum memory for the VM is 2048 MB, however 4096 is suggested. You can change the amount of memory later. You can change the size of the virtual hard disk by clicking the Hard Disk icon. The size of the virtual hard disk, should be a minimum of 20 GB. While this setting can be changed later, it is a multi-step process not covered by this guide. Therefore it is recommended that you size the virtual hard disk to be large enough for your software development activities. Note: The space on your host system’s physical disk will not be allocated until it is used by the VM. 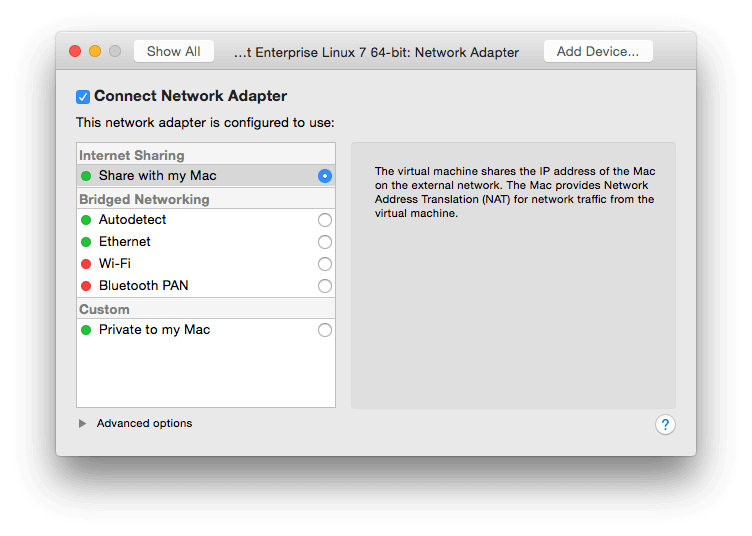 Under Network Adapter, you can set the VM’s networking configuration. The default is Network Address Translation (NAT) which is recommended as it is the easiest to manage. You may want to choose Bridged to attach the VM directly to the physical network. See VMware Networking below for more information. Close the VM settings dialog. The VM should now boot up from the Red Hat Enterprise Linux Server DVD .iso file. Note: When you click inside the VM window, the keyboard and mouse will be captured by the VM until you hit Ctrl and Alt on Windows or Ctrl and the Command key (⌘) on the Mac. When the system is fully installed this will no longer be necessary. See Open VM Tools replaces VMware Tools for Linux. The default VMware network configuration is for the VM to share the host system’s network connection(s) and IP address using network address translation (NAT). This is the easiest to manage and will be fine for many uses. Using NAT, the VM will be able to access resources on your network or the Internet. However services, such as a web server, running inside the VM won’t be directly accessible from outside of the VM. Alternatively, you can attach the VM to directly network by sharing the network adapter from the host system as a bridged network adapter. In this configuration, the VM gets its own IP address, usually using your network’s DHCP server. The VM appears on the network the same way a physical computer would with its own hardware MAC address. The host’s network adapter is shared by a device driver that is installed by VMware. The VM’s virtual network adapter can only be bridged to one physical network adapter at a time. If your system has more than one network adapter you need to choose which one to attach to. If your system switches between wired and wireless connections, you will need to switch bridged adapters for the VM. Networking, both physical and virtual, is a large topic beyond the scope of this guide. For more information see Networking options in VMware Workstation and Fusion or the networking section of the VMware Workstation User’s Guide. Enable copy-and-paste between the host system and the VM. Provide better mouse pointer integration. Allow resizing of the VM window which will change the size of VM’s graphical desktop. Open VM Tools does not currently include the driver that is needed for shared folders. To enable shared folders you need to run the VMware Tools installer. You may create a folder that is shared between your host system and the Red Hat Enterprise Linux VM. This makes it easy to share files such as source code between the two systems. Enabling VMware shared folders requires installing the VMware Host Guest File System (VMHGFS) driver on the VM. The VMHGFS driver is included with VMware Tools. By default, the VMware Tools installer will install the VMHGFS driver and leave the existing installation of Open VM Tools intact. This is the suggested configuration for enabling shared folders. VMware Tools are packaged as a .iso file, which will be used on the VM as a virtual CD. VMware will load the virtual CD when you select Install VMware Tools. For VMware Player on Windows, select Manage from the Player menu. Then select Install VMware Tools. For VMware Fusion on Mac OS, select Install VMware Tools from the Virtual Machine menu. Then click Install on the pop-up. Dismiss the Open with Files pop-up on the VM by clicking the X. If VMware adds a message at the bottom of the VM window, dismiss it by clicking on the X. Open a Terminal window in the VM from the Applications menu. Change to the root user with su -. You will need to enter the root password. In the directory listing, make a note of the exact file name of the .tar.gz file to use in the next command as the version number may have changed. The installer will ask a series of questions. Accept all the default choices by hitting the return key with the exception of Would you like to enable VMware automatic kernel modules?. Answer yes to enable automatic kernel modules. From the Player menu, select Manage, then select Virtual Machine Settings. Select the Options tab on the left from the VM Settings dialog. Select Shared Folders in the list on the left. Select Always Enabled under Folder Sharing on the right. On the Add Shared Folder Wizard, click Next. Click Browse and navigate to the folder you wish to share. Enter the name for the shared folder on VM. Do not use spaces. 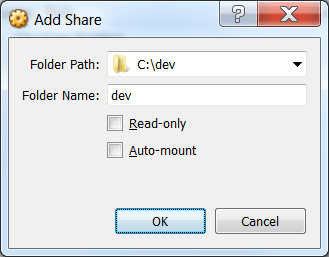 Optionally, check Read-only if you want to prevent the VM from being able to modify the shared folder. On the VM the path to the shared folders will be /mnt/hgfs/<folder name>. Click the Settings (Wrench icon) button. Click the Sharing icon under System Settings. Make sure Enabled Shared Folders is checked. Navigate to the folder you wish to share. Optionally, change the name of the shared folder by clicking in the Name column. Do not use spaces in the name. If you want to prevent the VM from modifying the folder, select Read Only in the Permissions column. You can also view the entire list of software collections including databases (MongoDB, PostgreSQL, etc), web servers (Apache httpd, Nginx, etc. ), and more, in the Red Hat Software Collections Technology Brief on the Red Hat Customer Portal.